Solid Mastermind Product Reviews focus on products that are useful to members of the Solid Mastermind community. These can be relevant third party products or Solid Edge modules for Solid Edge users. Each product has a overview and user reviews with ratings. The user reviews and product ratings are submitted by fellow members of the Solid Mastermind community. The more the Solid Mastermind community contribute the more valuable these reviews become. Before investing in any new product why not investigate what our peer group think. New products will be posted regularly that will provide a living library of product reviews. 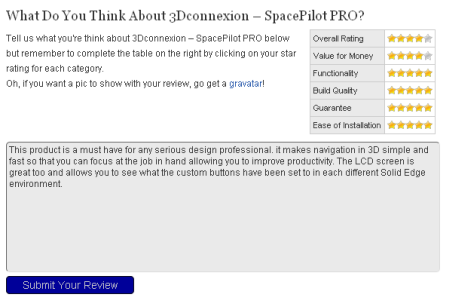 Browse this rapidly expanding library of Solid Edge Product Reviews using the navigation under Member Content at the top of this screen.